If you've ever been in charge of hosting Thanksgiving, you understand the importance of being organized. Between the timing of food going in and coming out of the oven and all the prep work that takes place BEFORE the big day...it's important to have all of your ducks turkeys in a row. So to help all of my fellow Thanksgiving Warriors...here are some helpful printables that you can add to your Planner or Home Management Binder. Use this printable to help you plan your menu and assign different dishes to your guests. There is also a handy shopping list on the right so that you can make your grocery checklist while you plan. 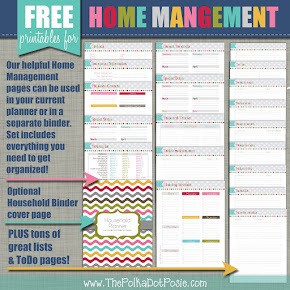 This printable will work great in your planner or binder, but it would be just as useful hanging on your refrigerator. It includes an hourly schedule for planning when food goes in and comes out of the oven, a "cooked" checklist of your food so you can keep track of what's done and a "Don't Forget" section for important reminders. Use this printable to help you with all of the cleaning, decorating and table setting that needs to take place before the big day. There is also a section just for "Kitchen" so that you remember to pull your turkey platter out of storage and have your gravy boat washed and ready to go. In the middle of all the craziness of the holiday, it's easy to forget to count all the blessings we are truly thankful for. Use this printable to journal all of your blessings and keep it for years to come. Use this printable coloring page as a decoration for the big day, or as an activity to keep the kids busy at the table :-) These would be a perfect addition to a scrapbook too. All of the links above are sized 8.5 x 11", but if you happen to carry an Arc Junior, Daytime Desk size or other planner that fits 5.5 x 8.5" pages...here is a small set just for you! Well I hope you all find these pages helpful!! I love them! We are hosting Thanksgiving at our house this year for the first time and these printables will be perfect!!! Thank you for sharing!!!! I am so glad you can use them Danielle!!! They do now! Just click on the link to the small pages at the end of the post :-) Enjoy! Jen ~ You are awesome! Thanks for sharing your talents with the rest of us!!!! I absolutely love these! I love making printables and enjoying others work. Great job! Jen, I'm having a hard time printing your Thanksgiving printables... would it be possible for you to send it to me in a file format at staceys910@yahoo.com - I really appreciate it! 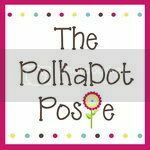 I love this so much that I featured it in my blog post today! These are great! Thank you for your generosity. These are great printables and I used them myself for my Thanksgiving planning this year. I wrote about them, linked back to your website and posted a link below. Thanks for making them!